Can’t believe it was May 2015 when my car was totalled this is the longest I’ve been without a car since I passed my driving test in 1973. Spent the last few days trawling the internet car sale sites, I don’t want to spend lots of money as the car will have to stand on the road, but it needs to be good enough to take me over to France next year to see my friends. The main reasons for wanting another car is to get the cats easily to the vets for their annual vaccinations, and Fleur needs her teeth cleaning. Also I want to get out and about more with my cameras to different locations, having being spurred on by some old negatives I found from the Rolleiflex the other week. 100 percent crop from the above. Where they filmed The Prisoner TV series. This is a really old one from the 1980’s. Fortunately most of the Steam Engines were rescued and can be seen running on the many preserved railways around the UK. Well back to searching the internet for a car. Have a great weekend. 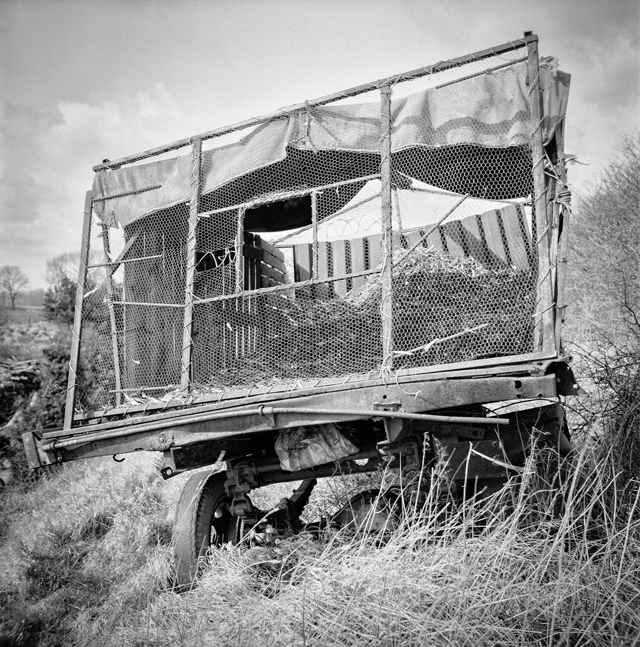 This entry was posted in Black & White, Film Photography, Old Photographs and tagged Derbyshire, Old Cameras, Photography, Rolleiflex 3.5f, Steam Engines, Wales on November 3, 2018 by conspicari. I have been slowly sorting out the spare bedroom at home. It was my B&W darkroom for a while until I got the digital photography bug, I’m now finding myself drifting enjoyably back to film photography. I keep getting dreadfully waylaid when sifting through the stuff that I’ve put away in that spare room. One of the items that caught my attention was an old negative file of 6x6cm negs from my Rolleiflex 3.5, that then got me to thinking of how I came to be the owner of the Rollei. I worked at a large electrical engineering company as Reprographics Manager during the best part of the 1980’s. I can see in the photograph above a Xerox 9400 copier (state of the art at that time) a Victory Kidder guillotine and Kodak Verilith platemaker, both quite old hat but they did the job. The Rolleiflex was the go to camera for staff leaving do’s, presentations, and passport photo’s. It had had a hard life, so the decision was made to replace all of the camera equipment in the photographic department with new state of the art gear. From memory that included a Mamiya RB67, Mamiya c330 (Rollei replacement) ToyoView 5″x 4″ camera and a DeVere 504 enlarger. So the Rollei came up for grabs, and my senior manager asked me if I would like to buy it for £5, well I bit his hand off, and thats how I got my lovely Rolleiflex. I was (very much so in the 1980’s) and still am learning about photography. I couldn’t wait to try the camera out, it was a totally different experience from the Zenith E that I had at the time !!!! I only know what date this was by looking up the information on the web. It was January 1985. But I can remember that the weather was cold, dull, and misty. I think thats the top of my head in upper part of the frame ! The Meopta enlarger is still set up in the spare room gathering dust and cobwebs, I plan on starting to print some of my images later this year. I will have to read this excellent book by the late Gene Nocon again before I start dunking paper into chemicals. About 5 years ago I had the Rollei CLA’d as the slow shutter speeds were sticky, so I think it’s time to start using it once more. This entry was posted in Analogue PHotography, Black & White, Darkroom, Film Photography, Rolleiflex and tagged Black & White Film, Film Photography, Old Camera, Old Photographs, Printing, Reprographics, Rolleiflex 3.5f, Xerox on May 18, 2016 by conspicari. Bryce 2001* It was 1992 !!!!! Bryce Canyon, clouds rolling in. Really enjoyed the visit to Bryce Canyon, this photo is from 2001* 1992 on my first trip to the USA. Took this shot on my old Rolleiflex 3.5f on colour neg film. *I can’t believe I thought it was 2001, checked my passport and it was 1992. This entry was posted in Bryce Canyon, Film Photography, Nature, Rolleiflex, USA and tagged Film Photography, Old Photographs, Rolleiflex 3.5f on January 27, 2016 by conspicari. 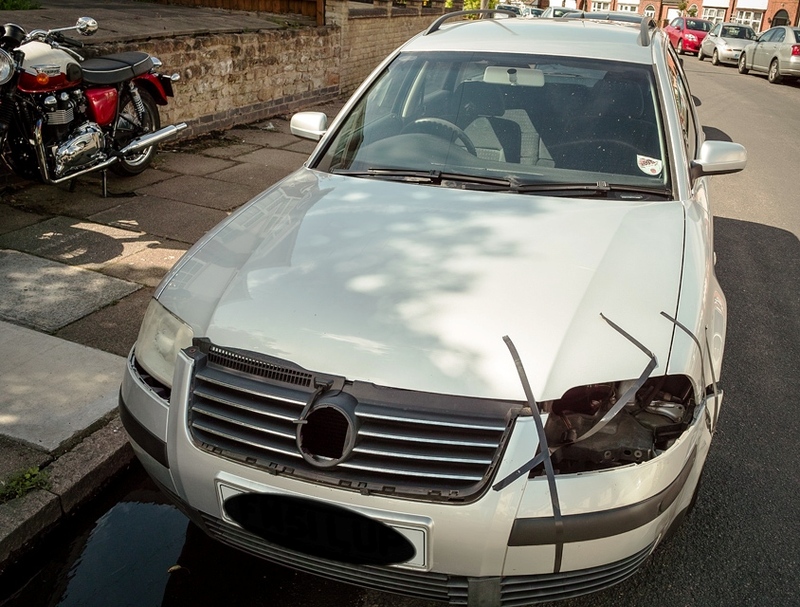 This was my lovely old passat after a car swiped the front of it, then demolishing a lamp post before finally coming to an abrupt halt by the garden wall of the house next door, fortunately no one was hurt. I certainly wasn’t as I was quietly dozing on the sofa in the backroom of my house at the time ! The insurance company said it would be uneconomical to repair my car so I am now looking for a replacement, not an easy task with what I am prepared/want to pay to be mobile again. I have never been a great fan of public transport (but needs must now) and as I have attained a certain age I qualify for a travel card which gives me free off peak bus journeys in the city area. So off I went this morning by bus to the other side of town to have a look at a car I had spotted online, was not that impressed with the car so back to the bus stop where a young women was also waiting, I asked her if this was the stop for going back into town, we struck up a bit of a conversation and she told me she was on her way back from art therapy which was helping her get over depression, I told her that photography kept me occupied now that I wasn’t working (by choice) and being creative certainly helped me keep my spirits up. When I got off the bus I got a lovely smile and a wave from the young women. The bus for the last part of the trip home had a lot of old age pensioners aboard, I guess Thursday must be pension day, they all seemed to be having a good time and were really enjoying their journey. Maybe bus travel isn’t so bad ? I bought the Photina secondhand from a local camera shop more than 20 years ago, only used it a couple of times. When I scanned in this old negative I was amazed at the detail the lens on this humble camera had picked up. I took this image about 20 years ago on the Isle of Eigg (west coast of Scotland), it wasn’t ideal weather for infrared but it came out ok. Again viewed at 100% the amount of detail is incredible. Both of these TLRs will certainly be out and about with me again. 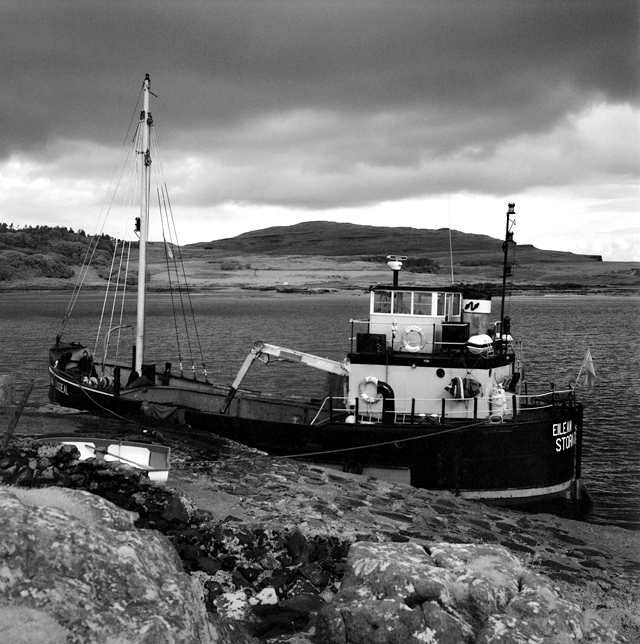 This entry was posted in Film Photography, Nature and tagged Black & White Film, Clyde Puffer, Isle of Eigg, Konica ir750, Photina, Rolleiflex 3.5f, TLR Camera, VIC 72 Eilean Eisdeal on May 21, 2015 by conspicari.